On August 31, 2011 was released Opera 11.51. 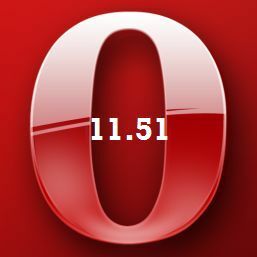 Opera is a browser for surfing the web mainly, and other services related to plugins, privacy, security, social networking, multimedia, etc..
What's new in Opera 5.11? - quickly and efficiently - by implementing an engine on which there have made important changes, including elimination of thousands of issues aimed at the stability of the old versions. Other changes aimed to Opera 11.51 are related to minor adjustments on the interface, display, scripting, mail, news, chat, network and security. - 20 MB (recommended 100) free space on HDD.